The east/west ditches just north of the Clump will be extended to the west and north to follow the ditch and post features. During March it is anticipated your unit will be invited back to the Peacehaven Barrow to help Sue Birks (Site Director) carry out further investigations into the ancient Barrow. The advantage of this excavation is the knowledge gained by the field unit through working on a variety of sites on different terrains and in different locations. The unit have a great deal of experience and skills in working on the ancient natural chalks of the South Downs, this site is completely different in that the natural geology is one of sands and where subtle features can be difficult to identify, therefore great care must be taken when excavating. Once each feature has been identified it must be carefully exposed, excavated and recorded. During May-June the unit will again return to the manorial site at Ovingdean to investigate the possible 'detached' kitchen area, and another quadrant of the manor house, located just north of St Wulfran's church. Other areas of archaeological interest will also be investigated during the season and these will include a small excavation at Varley Halls. The geophysical team are planning to conduct resistivity surveying at Piddingwoth Manor, near Stanmer, Beacon Hill, Rottingdean and Woodingdean. Later in the year, after crop removal there will be a survey at Ovingdean where a rectangular enclosure has been observed in one of the fields near St Dunstans. The post excavation examination of artefacts from our excavations at Rocky Clump proved very popular, with several new faces joining the BHAS team. 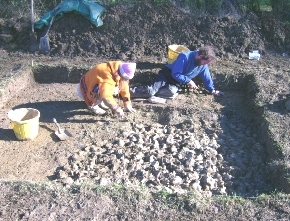 The finds processing allowed hands on experience of Roman pottery, shell, bone, glass and metal items recovered from the various ditches excavated in 2007. Keith Edgar, who has been studying both the Roman pottery from Rocky Clump and the medieval pottery from Ovingdean, gave a presentation to the group in February. Keith discussed the various fabrics and forms that assist with the identification of pottery, the kilns and the areas it came from. Rocky Clump has pottery from Rowlands Castle, Hardham, Wickham Barn and Arun Valley wares, as well as the ubiquitous East Sussex Wares and Samian. The pottery at Rocky Clump appears to be a very odd collection of vessels and shapes that would seem to have been deliberately placed. Does this suggest that the site is actually the location of a shrine? Several pieces of Roman roofing tile were noted from the north ditches this season. Several pieces of box flue tile have also been found in the past. The tile has probably been taken from another more prestigious site close by. This site is yet to be found. October saw the BHAS team back at the Arlington Roman site. This year the main trenches were targeted on two areas which produced strong geophysical results. The first took in an area of the northern road ditch which had shown anomalies on both the resistivity and magnometer surveys done by David Stavely. Two trenches were opened two metres apart, in the first of these a ditch was found running north/south into the road ditch. Once through the plough soil the now familiar grey Roman occupation layer appeared with it's abundance of 1st and 2nd century Roman pottery. A second trench was opened parallel to the first and again was soon down to the occupation layer. This trench was the more interesting of the two as not only did it have the ditch running north/south but it also had an area of flint. At first it was thought that it might be the remains of a wall but as more of it was uncovered it became obvious that it was not a wall but more like a revetment to support the area where the two ditches joined. Again this trench produced the types of pottery we have come to expect on this site, Samian, (southern and central Gaul), East Sussex Ware, New Forest Ware, Rhenish Ware, sherds of Amphora plus various types of grey wares. 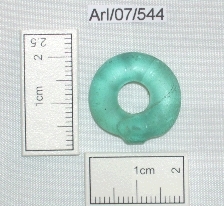 Also found in this trench was a small Roman glass bead, (Photo 3). Not visible in the photo is the delicate decoration around the edge of the bead. 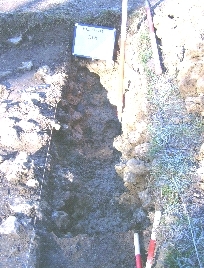 In the third trench opened on a magnetic anomaly a furnace was found with a ditch on the south side. Although only a small part of this was excavated slag was collected by the bucket full from this area. These two areas will be the main focus of the next phase of the planned excavations. In another trench, opened on the southern side of the road in an area of apparent habitation, a possible hearth was found in the very edge of the trench. Unfortunately, before this could be excavated fully, rain (the curse of Arlington), flooded the trench. On one Saturday the conditions were so bad that rather than do any damage to the site everyone went to Greg Chuters and did some pot washing and marking. Towards the end of the year the weather got so bad that it was impossible to work in the trenches with the possibility of doing harm to the archaeology so it was decided to shut down the site and move to another site three fields to the east. This part of the site had been brought to our notice by one of the locals who regularly ploughed the field and told us that he hit a "rocky" area at the edge of the field. 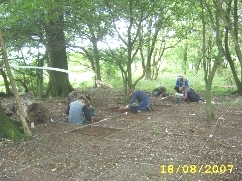 After an impromptu field walk a flint area was found and marked for later excavation. The first weekend in the New Year saw the team split between the two sites, back filling at the old site and opening up trenches at the new site. At first it was thought that we had found the Roman road again in the new trenches and that Margary's line was out by 50 metres. After three or four weekends excavating it became clear that it was not a road but a flint platform some 6 metres square. It appears to have greensand at the corners and a greensand walk way on the eastern side. The platform has been divided into 4 and at present 3 areas have been opened. 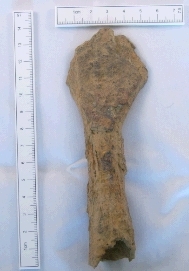 In one quadrant the flint has been removed (Photo 4). The platform is made up of 5 layers of downland flint to a depth of just over 500mm. The top 4 layers have a thin layer of silty clay and iron stone between them and the 5th layer has a chalk layer between it and the next. Again the finds, although very few at present, have been mainly 1st and 2nd century. A few metres to the north of the platform another trench was opened on a geophysics target, just under the topsoil it was soon apparent (Photo 5) that we had found at least 4 cremation burials. For the most part the burials have been ploughed out and only the very bottom of cremation urns are left with a small scattering of cremated bone. This site is not due to go under the plough for another two years so we will have plenty of to time excavate this area. Maria Gardiner and I have commenced the post excavation work on the 2007 season; all bone recovered from Ringmer and Rocky Clump has now been identified and recorded and the reports are in the course of preparation. The 2008 season opened at Rocky Clump over the Easter weekend (in less than ideal weather conditions - snow showers if you please!!). The northern (bones) trench is continuing to yield up volumes of bone, on Easter Saturday we recovered a virtually complete horn core, (Photo 8). On Saturday, 29th March, Mark Gillingham and I block lifted what is potentially a skull, together with part of a maxilla (upper jaw) of a horse - it will be interesting to see if the skull mentioned is also of a horse. As part of an MA in Field Archaeology I am undertaking at the University of Sussex, a small team from the Field Unit undertook a series of walkover surveys around the village of Ovingdean. This literally meant recording anything that had the potential for archaeology. We identified the following possible sites: two barrows or windmill mounds; two potential sites for the medieval village as opposed to the manorial complex in Hog Croft; two potential platforms; and areas indicative of Iron Age and Roman landuse. My thanks go to John, Norman, Bill, Maria, Fran and Jane (over for the Christmas and New Year break from France) without whom I could not have undertaken such a large area. A possible Palaeolithic hand axe was recently found by Mr David Bangs and his friend in a ploughed field on land to the east of Blunt's Wood near Barcombe. The field is north of the stream that runs across this particular field. The bi-face has a mainly black/brown patination with a number of yellow/white striations. The artefact is broken. It measures 130mm in length and 95mm in width and about 25mm in thickness. Both linear measurements are not the complete overall dimensions. The axe is one of several found in this region. A very fine example was excavated at the Barcombe villa site a few years ago. The artefacts apparently derive from riverine gravel terraces that appear to have been exploited during this time of antiquity. The Brighton and Hove Archaeological Society would like to thank Mr Bangs for bringing the object to their attention. The society will endeavour to have the object drawn and a short note placed in the Sussex Archaeological Collections. Early in 2008 Mr David Bangs, of Brighton, walked around the Beddingham area and he noted considerable quantities of fire-cracked flint in a field located west of Preston Court Farm. The fire-cracked appeared extremely concentrated on the southern, upper reaches of the field where there is almost a pathway of fire-cracked. (Pers comm. D.Bangs). This may possibly be the location of a ploughed out flint cairn? The author and Mr Bangs re-visited the field on Saturday 1st March 2008 and both again noted numerous pieces of fire-cracked flint. The concentration of flint appears to be focused in a shallow depression on the side of the hill. (TQ456070). The field is known to contain a small Roman building, possibly associated with the large villa complex excavated at Beddingham during the 1990's. The finds recovered also lay close to a known Saxon cemetery. 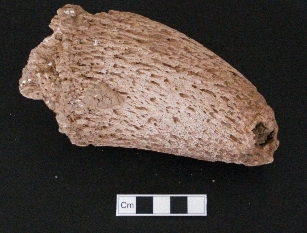 (1x) Classic Neolithic white patinated (Oyster shaped) scraper. A total of 15 sherds of pottery were collected on the first visit, with an additional 4 sherds on March 1st making an overall total of 19 sherds for both visits. Iron Age evidence is depicted by 3 sherds of pottery (16%). The inclusions of flint vary in size from 0.3mm up to 4mm in length. One piece is a very hard sand tempered sherd which is very similar to known Iron Age Caburn pottery. Caburn lies immediately north of this field. The pottery, flint work and fire-cracked flint are supportive evidence for the archaeological remains and features known from this field. It would require further organised field walking and geophysical surveys to determine the exact nature and location of these features, and determine the accurate location of the 'pathway' of fire-cracked flint. The Beddingham Roman villa was excavated by South East Archaeology and University College London (UCL) for about six years from 1989 to 1995. The villa was a substantial building having large main rooms, corridors at the front and rear and an early bath house attached to the northern side. There were also winged rooms on the east side. The villa also had a large well, similar to the one excavated at Barcombe this year. Other similarities to the Barcombe villa included earlier phases which incorporated an Iron Age round house and Bronze Age cremation burials. The Beddingham villa had a later bath house located further east from the main building, further down the gentle slope towards a stream that runs from a spring located in the north facing scarp slope of the Downs. The villa is located just east of Lewes and close to the Beddingham roundabout.